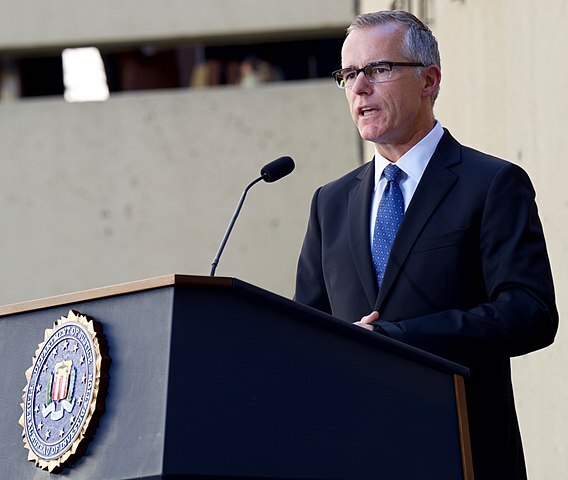 FBI Deputy Director McCabe announced his resignation on January 29, 2018. He went on paid leave until March 18, when he would officially retire. Attorney General Sessions terminated McCabe on March 16, thereby removing McCabe’s pension. Sessions said he was following the recommendation of the FBI’s Office of Professional Responsibility, which claimed “Mr. McCabe had made an unauthorized disclosure to the news media and lacked candor – including under oath – on multiple occasions.” The report that Sessions cited has not been publicly released. There are several factors that cloud McCabe’s termination. First, Mr. Trump has constantly taunted McCabe on Twitter, before his resignation and after his termination. McCabe has solid evidence if he wants to sue and argue that his termination was the result of a personal grudge instead of an objective investigation. Second, McCabe was a witness who observed James Comey documenting his meetings with Mr. Trump. The Special Counsel could prosecute McCabe’s termination as witness tampering and intimidation. Finally, McCabe had approved an investigation into Jeff Sessions for perjury when he testified to Congress last year. If true, McCabe’s termination could be retaliation by the Attorney General. Employment in the United States is usually at-will. This means that either employer or the employee can end the relationship at any time for any reason. The exception is if the employer terminates the employee for an illegal reason, such as a breach of contract or racial discrimination. However, many government positions, especially positions that directly report to elected offices, do not serve at-will. Government positions are protected to ensure that political bias does not affect operations of government that should be non-partisan, such as military defense or criminal investigations. They can only be terminated for good cause. “Good cause” is essentially the opposite of at-will employment. At-will employment means that an employee can be fired for any reason except for an illegal reason. Good cause means the employer can only terminate the employee if the employer has a legal reason for doing so. The Justice Department would claim that it had good cause for terminating McCabe – leaking classified information to the media and then denying it while under oath. However, McCabe is denying the allegations completely. Since no one has seen the report by the Office of Professional Responsibility, Sessions may be on thin ice with this decision. If McCabe sues and he is right, then McCabe’s termination would be invalidated and his pension restored. McCabe would most likely argue that the allegations against him were a pretext. A pretext is a false reason given to fire an employee instead of the actual reason, because the actual justification is illegal. McCabe could argue in court that he was really fired for all the reasons mentioned above: a President’s personal grudge against him, an attempt at witness tampering, and retaliation by an Attorney General who was afraid of the investigation that his target had authorized against him. Given that there was only two days left before McCabe’s resignation, the Trump Administration’s decision to terminate McCabe is legally very risky. What Do Employees Get If They Win Their Lawsuit? Although McCabe is a very high profile case, he is not unusual. According to the EEOC, 41,097 wrongful termination cases based on retaliation were filed in 2017. The average settlement is about $40,000, with 10% of settlements resulting in a million dollars for the employee. About 67% of wrongful termination trials in court are won by the employee. Notably, very few cases result in the employee returning to work. First, employees are required to mitigate damages – they cannot do nothing and then demand back pay when they could have found another job. Second, a wrongful termination often means bad blood for both sides. Few people want the drama and potential hostility that may come after a lawsuit. Finally, many states may require the employee to choose between a large settlement and returning to the original job. Most employers would replace the terminated employee right away. It would be unjust to fire the replacement just so that that wrongful terminated employee could return.